OBJECTIVES: Diabetes and exercise training have been shown to involve interleukin 6 (IL-6) signaling in muscle. However, the relationship between the actions of these two stimuli on muscle IL-6 and their downstream components is still unknown. Thus, the effect of endurance training on the key components of muscle IL-6 signaling transduction was investigated in a rat model of type 2 diabetes. 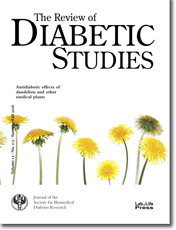 METHODS: Diabetes was induced by streptozotocin (STZ) in male Wistar rats fed a high-fat diet, with normal rats acting as controls. The animals were left to conduct their normal activities or assigned to endurance training in a treadmill. At the end of 8 weeks, blood biochemical profiles, exercise performance, muscle oxidative capacity, glucose transporter 4 (GLUT4) protein distribution, and expressions of IL-6 and its downstream proteins were determined. RESULTS: Blood biochemical profiles of the diabetic rats were altered compared to normal rats, whereas endurance training improved blood chemistry and exercise performance. It also increased muscle oxidative capacity, and promoted GLUT4 subcellular localization to the membrane in muscles. Furthermore, protein expression of IL-6 receptor (IL-6Rα) was increased in both normal and diabetic rats after endurance training, but no significant changes in IL-6, phosphorylated signal transducer and activator of transcription 3 (p-STAT3), or suppressor of cytokine signaling 3 (SOC3) were observed in muscles of normal and diabetic rats. CONCLUSIONS: IL-6 signaling pathway mediating muscle response to endurance training was conserved in type 2 diabetes. There was no link between training-induced IL-6 downstream targets in skeletal muscles and IL-6-induced type 2 diabetes.